Grade CZ121 aka CW614N is the free machining grade of brass. Its excellent machinability is achieved by the addition of approximately 3% lead into the materials composition. The lead aids lubrication and also acts as a chip breaker. 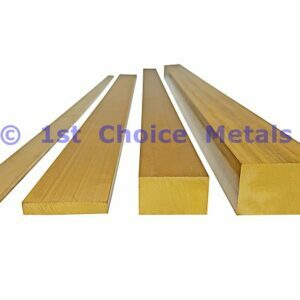 CZ121 brass flat bars also have excellent corrosion resistance and strength. This makes them ideal for applications where it will be exposed to moisture or to the elements. This being one of the main reasons why brass is heavily used on boats, not only as polished decorative strips, trims and rails but also for various handles, valves, clocks, dials, bearings and fixings that can be found in both a boats cabin and also in the engine room. Due to its bright gold colour, its ease of polishing and also its comparative low cost, brass bar is often cut and machined to produce items of jewellery. Grade CZ121 brass flat bars are not recommended for cold forming, although with the application of heat some bending will be possible. Should the size that you require not be listed below, or should you require a different grade of Brass Bar then please contact us and we will send you a quote.